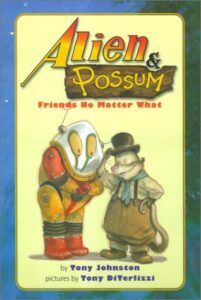 The next session of the second grade book club will focus on Alien and Possum, Friends No Matter What, by Tony Johnston, a book that offers three stories about the unlikely friendship between a possum and a creature whose spaceship crashes near possum’s tree house. In November, the club will discuss Who Cloned the President?, which is Book #1 in the Capital Mystery Series by Ron Roy. I read this article and found it very interesting, thought it might be something for you. The article is called Second-Grade Book Club: Alien and Possum, Friends No Matter What and is located athttps://www.pelhamlibrary.org/programs/second-grade-book-club-alien-possum-friends-no-matter.